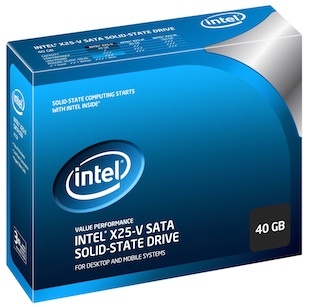 Intel has started to ship solid state drives which it claims to speed up Windows 7 load times. The drives are aimed at dual boot desktop systems and also for notebooks. SSD drives increase the speed and performance of the system dramatically from the standard hard disks but cost more per gb which has limited their acceptance. The Intel X25-V is a relatively low-capacity SSD at 40GB, and its performance is four times faster than a 7200RPM hard disk drive and costs $125. Intel branded SSD’s have stormed the retail stores and the confidence in Intel is helping it beat down the fact that it costs about 3$ per gb. OCZ Reveals Solid-State Drive with Sub-$100 Price. Hybrid Hard drive has Solid State Data Speed and Low Price! Intel’s introduces Third Gen SSDs! Intel to enter Smartphone Market with its Processor!